Audience: If everyone tries to achieve spiritual happiness then they’re not going to get married. The human race is going to go back down…. 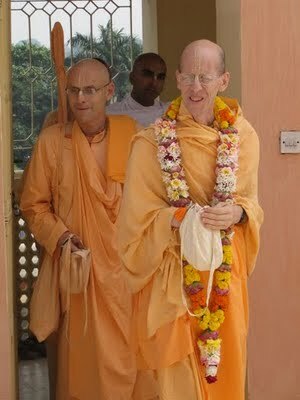 Jayadvaita Swami: If everyone tries for spiritual happiness, then nobody’s going to get married and that’s the end of the world…. 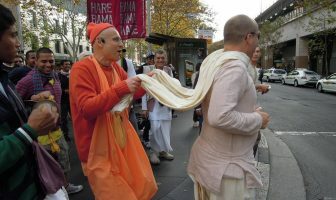 Jayadvaita Swami: Of course everybody’s trying to move things in that direction, knock down the population so, you know, let’s try it for fifty or hundred years! Try it the other way let’s do this! But I doubt that there’s serious endanger of seeing that happen, that everyone goes stark raving spiritual and that’s the end of marriage! You know it’s kind of like everyone’s going to get rich: It’s just not going to happen. That won’t happen. But it is just as well, not everyone’s going to be a PHD candidate. Not everyone’s going to do so many things. Not everyone’s going to be a philanthropist. But let’s not talk about everyone, let’s talk about, you. Let’s talk about me, let’s talk about us. You know what the whole world does we can leave till later. But you! Is it a sensible proposition for you to invest your energy in investigating or even pursuing spiritual happiness? That is really the question before us.